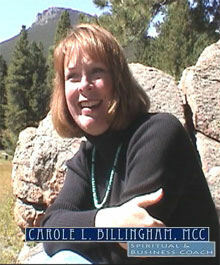 By Carole L. Billingham, MCC Have you ever noticed that when things start to get out of hand most of us simply try harder? Have you noticed that rarely does the extra effort really get us anywhere? In truth, the harder we try, the more out of control things get and the more frustrated we become. I just spent the last ten weeks struggling to overcome an acute case of Morning Sickness (that’s right, I’m pregnant!). Why they call it Morning Sickness is beyond me since most of us lucky gals experience symptoms at any or all hours of the day. I tell you, I tried absolutely everything from seasickness wrist bands to castor oil packs to peppermint tea. Nothing worked. The harder I tried to find a remedy, the more frustrated I became in knowing that it wasn’t working. Believe me, I was not willing to give up. I just knew that there had to be something that would work. Something, that I had simply not tried yet. Sure, I kept reminding myself that most women experience relief in their second trimester, but that wasn’t good enough for me. After all, that was a long ways off. (Close to 8 weeks, 56 days, or 1344 hours to be exact…..but who’s counting?!). I am a Super-Achiever that knows that if I try hard enough, I can solve ANY problem that comes my way! This would be no exception. As the days (and hours) passed, I had lots of time to spend thinking about my dilemma. I finally calmed down a bit and started to tap into the wiser part of me…the part that I like to call “My Higher Self”. The part of me that already has all of the answers, if I can just quiet myself down long enough to listen (not always an easy task). I decided at that present moment that I had two choices: I could continue to struggle and to focus on my discomfort, remembering that what I focus on expands. Or I could let it go and trust that God and My Higher Self Know what is best. I chose the latter. In the weeks that have passed, I have decided that God knew me well enough to know that I needed to experience a certain level of discomfort before I’d really slow down and get the rest that me and my baby needed. That perhaps, ultimately my baby’s health (and maybe even life) depended on it. I realize that I may never know why I needed to experience those ten weeks in bed, but I do know that it brings me comfort to trust that everything that happens in my life is for the best…even if it is beyond my present understanding. It really comes down to a simple choice: focusing on the limits of my human-ness or centering on my ability to remember the limitlessness of my Spirit. I think that I’ll choose the latter. By the way, I’m out of bed and feeling great! Just 24 more weeks to go! Why do I love doing what I do? Take a moment to watch My Role as a Wisdom Coach on YouTube. Please feel free to add this link to your Web site or Blog. I would be honored. The Dates are Set! Sign up NOW for the 2008 Wise Women Circle Group! Dates are: January 23 & 30, February 6, 13 & 20, March 5, 12 & 19. The Wise Women Circle Group meets three times a month for 55 minutes. As a participant in the group, you will receive the support of me, as your coach, to guide you along your journey forward as well as the support, interaction, feedback, and encouragement from women in the group. Each month we cover specific areas of living and you will receive personalized attention and direction for you to upgrade your life. Then, you are the kind of person that I love to work with! I’ve made space for two (2) new clients in my practice for this year. I’d love for one of them to be you. You are currently browsing the The Wisdom Coach blog archives for January, 2008.